Hilton At Home Jobs – What They Pay & How to Start! Published October 27, 2014 By Leisa Good This post may contain affiliate links. Regardless, I only recommend sites I've researched and/or used and trust. Do you enjoy the hospitality industry? Have you ever worked in a hotel before? Is a performance-driven job what you have been looking for? Then the remote positions at Hilton Worldwide might be what you are looking for in a work-at-home (WAH) job too. What Exactly is Hilton Worldwide? While most people are familiar with the name Hilton when it comes to hotels, Hilton Worldwide is a collection of all of the Hilton Hotels throughout the world. Back in 1919 in a small Texas town, Conrad N. Hilton began with a 40-room hotel and his vision has helped to grow it to a prominent world-class hotel chain across 24 time zones. Hotels are known to employ a wide variety of professionals ranging from clerks to chefs to human resource professionals. However, for this article we will be exploring the three remote, work at home positions associated with Hilton Worldwide. These positions are the reservation sales specialist, the customer care coordinator, and the guest experience specialist. Each one is different. The Hilton vision for these work-at-home positions—according to their website—is, “to fill the Earth with the light and warmth of hospitality, working from home-based offices in Dallas, Texas and Tampa, Florida.” It doesn’t look like they currently hire in other states, but that could change in the future. What Does The Work Involve at Hilton Worldwide? The reservation sales specialist will be the one booking hotel rooms for the individual or family. Customer care specialists will help with any other care of the guests once they are in the hotel. And finally, the Guest Experience Specialist will have the job of taking customer complaints and turning them into a positive experience that will restore trust in the Hilton brand. 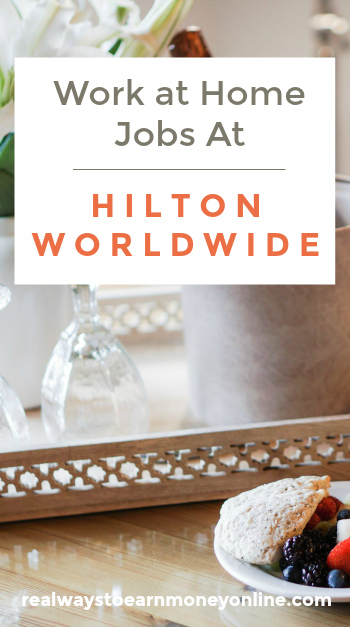 What Are the Skills Required to Have Any One of These Positions at Hilton Worldwide? at least 1 plus years’ steady job experience in a customer oriented or sales role. a minimum of 6 months to a year experience in a performance driven role. computer proficiency with the ability to navigate and toggle between multiple screens. What Are the Computer Requirements to Work at Home for Hilton Worldwide? Intel x86 compatible personal computer with CD burning capability and sound card or a MAC with sound card and a minimum of 512mb Ram memory, and a compatible monitor, keyboard and mouse. a home office free from background noise and distractions. What Are the Hours at Hilton Worldwide for These Positions? The hours will vary as with all hotel jobs. There are shifts involved, since people will be needing around the clock service. Both part-time and full-time positions are available. You are an employee with benefits. You will have access to dental, medical, and retirement. What Are the Pay and Hours Like at Hilton Worldwide? The pay for all of the above-mentioned positions is $12 to $15 per hour. Pay is based on performance. Top performers are quickly rewarded and can look forward to earning up to $15 per hour. Training is mandatory and paid. What Do I Think of the Work-at-Home Jobs at Hilton Worldwide? Well, it is the Hilton, and I have stayed at many of their hotels and resorts throughout the years. I love the hotels and impeccable service, so I know the service is that way for a reason. It sounds like a good opportunity if you are lucky enough to live in one of the states that hires for the WAH positions. What Do Others Think of the Work-at-Home Jobs at Hilton Worldwide? How Can an Interested Individual Apply for the Positions at the Hilton Worldwide? Visit our work at home job leads page to see what companies have had work at home openings recently. I just received a email from this company about taking a assessment, the position is different then what this blog is about Virtual Reservation Sales Specialist .I was just wondering about a few things if anyone has worked for them wah ,one being is getting the invite to participate in the assessment a step forward for hire , or do all that applied get this invite ? And call type and flows how is most of the customers temperament wise etc ? I also read on some reviews , they offer health etc and some says no , and also scheduling on the website they seem to pride them self’s with having flexible scheduling .